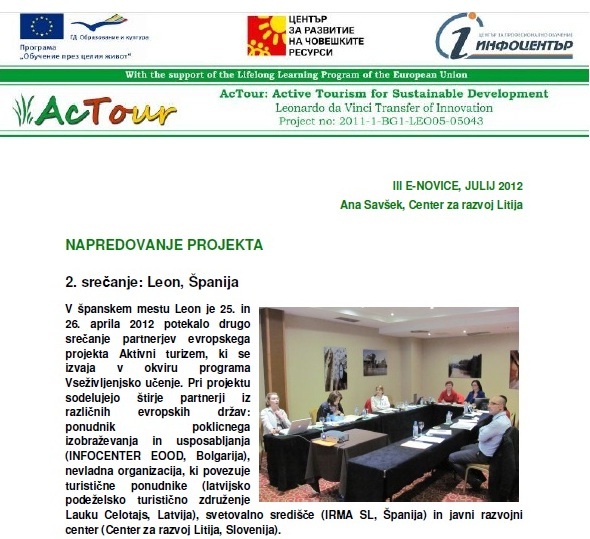 In October 2011, when the project AcTour has officially started, an article main objectives was published on Development Centre Litija's web site: www.razvoj.si. There is also a link to official project web site available. 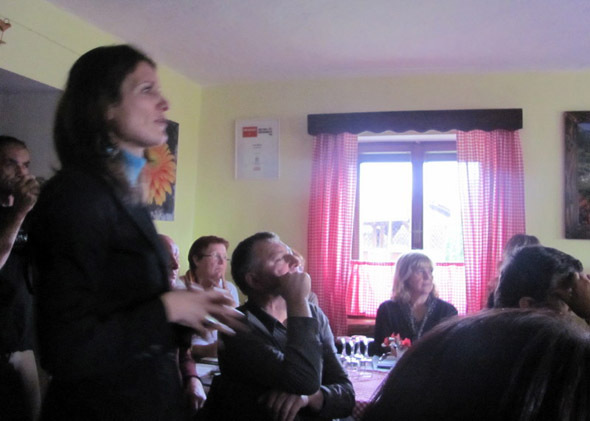 In November 2011 the project was presented to company Jarina, which is an incoming agency for the area The Heart of Slovenia. Memoranda of agreement was signed with Jarina for further cooperation on active tourism. 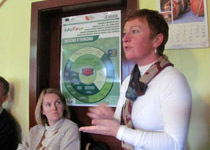 In December 2011 an article about the first partner meeting in Bulgaria was published on Development Centre Litija's web site: www.razvoj.si. In January and February 2012 survey among tourism providers was done and questionnaires about active tourism ware distributed. 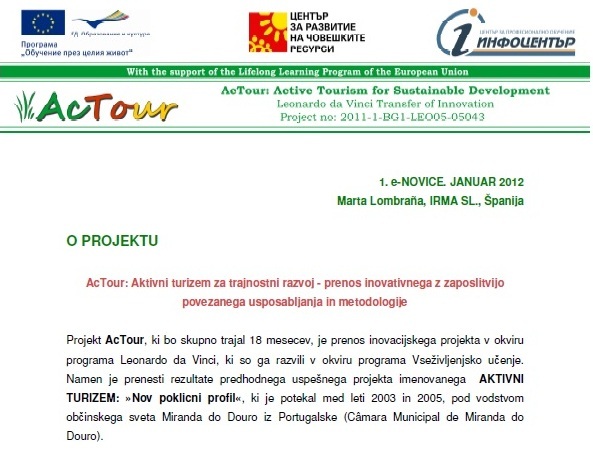 For this purpose we participated on biggest Slovenian tourism fair, Alpe-Adria, where we promoted project AcTour. Dissemination of the project was also done throught project newsletters. Newsletter I was released in January 2011 and it was sent to different stakeholders from Slovenia, and it is also published on web site: www.razvoj.si. 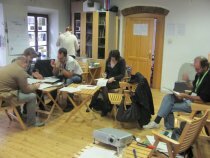 In February 2012 we presented the project to partners, who signed memoranda of agreement with Development Centre Litija: Notranjski ekološki center and Zavod AREA GEA. 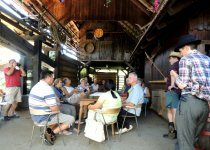 We also promoted new project web site www.activetourism.org. Newsletter II was released in March 2012. It was sent to different stakeholders by Development Centre Litija. It was also published on web site: www.razvoj.si. 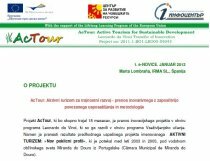 Project AcTour was promoted also in March 2012, when memoranda of agreement was signed with Center za trajnostni razvoj podeželja Kranj and Park Škocjanske jame. In May 2012 an article about the second partner meeting in Bulgaria was published on Development Centre Litija’s web site: www.razvoj.si. 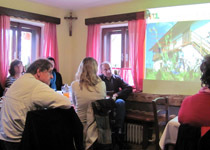 Active tourism and project AcTour web site were presented among participants in first promotional caravaning for campers in The Heart of Slovenia on June 1st 2012. Development Centre Litija has developed a new tourism product - camper tourism in The Heart of Slovenia. With this kind of tourism they will offer service in the countryside to a specific tourism group in an innovative way. Visitors will enjoy a diverse offer of the area, which is also strongly connected with active tourism. Dissemination and project web site presentation was also done among participants on second promotional caravaning for campers in The Heart of Slovenia on June 15th 2012. 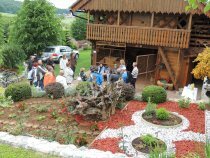 They visited Lukovica and Kamnik area: Snovik spa, Velika planina, Arboretum Volčji potok and Natural Healing Park Tunjice. Dissemination of the project was also done by Newsletter III, which was released in July 2012. 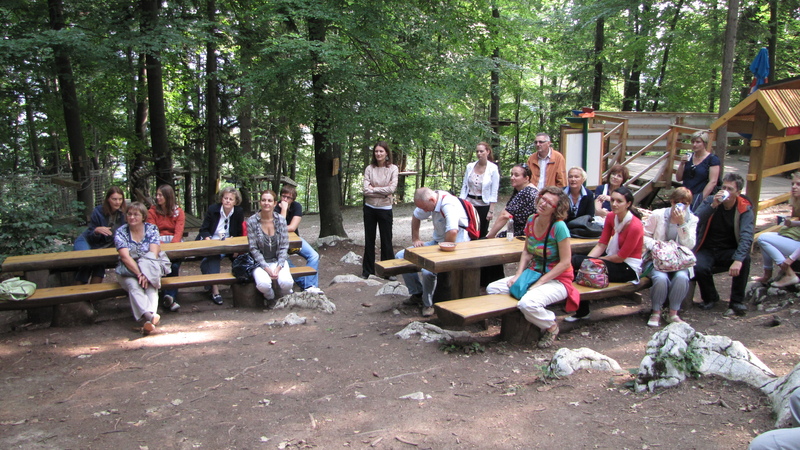 There was Geoss Adventure Park presented, as an example of good practice in the field of active tourism in Slovenia. Development Centre Litija distributed newsletter to different stakeholders and it was also posted on company’s web site: www.razvoj.si. In July 2012 we presented AcTour project to partners, with whom we met for the signing of memoranda of agreement: Tourist Association Šentrupert and Municipality of Šentrupert. We presented them new project brochures – folders with the main details of the project Active tourism. Also in August 2012 we were active on the field of dissemination of the project. New brochures of the project were presented to The Lipica Stud Farm and Mašun guesthouse. 2 memoranda of agreement were signed at this opportunity. In September 2012 we met with representatives of Geoss adventure park, organization Umanotera and company AA-Press. They were impressed by the project, therefore we signed memoranda of agreement with all of them. 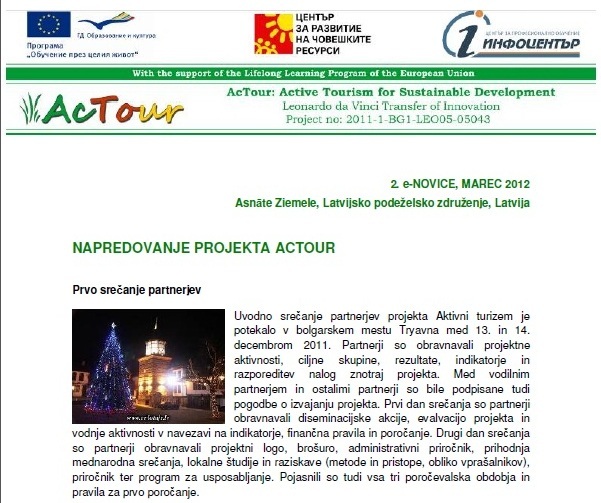 Dissemination action for AcTour project was organized in the beggining of November. 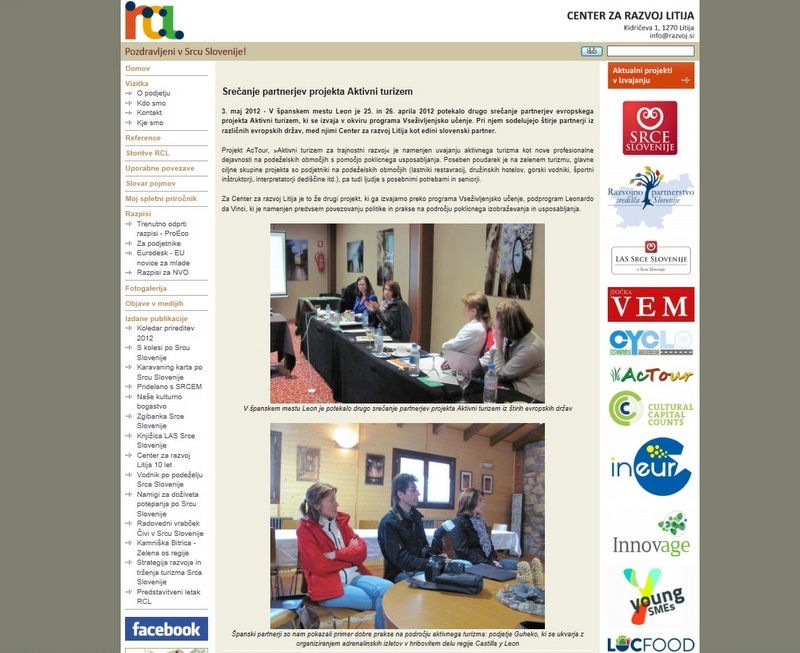 It took place on 5th November 2012 in Vače (Municipality Litija). 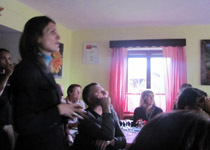 25 tourism providers attended the event from 6 different municipalities (Dol pri Ljubljani, Ivančna Gorica, Kamnik, Litija, Šentrupert, Šmartno pri Litiji). Active tourism project was presented through presentation and brochure, and also possibilities for training on active tourism, which will took place in January 2013 within the AcTour project.